In large bowl, mix gelatin and boiling water until gelatin is completely dissolved. In 2-cup measuring cup, mix reserved pineapple liquid and enough cold water to make 2 cups. Stir into gelatin mixture. Refrigerate until thickened but not set, about 45 minutes. Stir pineapple into thickened gelatin mixture. With rubber spatula, fold in 3 cups of the whipped topping. 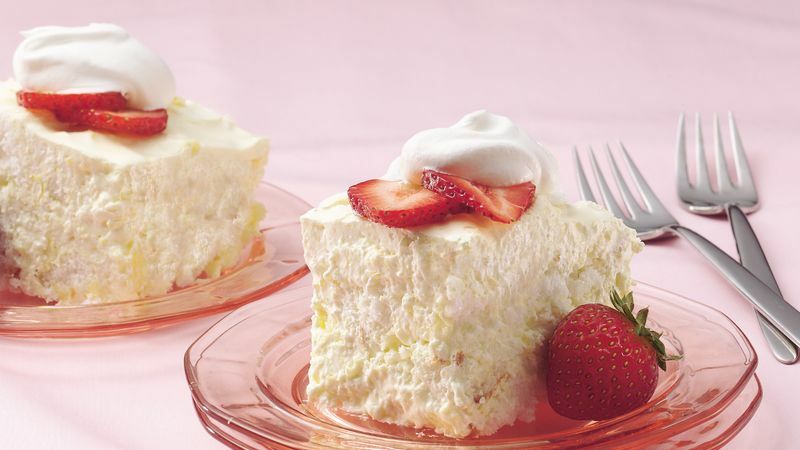 Tear angel food cake into 1-inch pieces, placing half of the pieces in ungreased 13x9-inch (3-quart) glass baking dish. Spoon half of gelatin mixture evenly over cake pieces. Repeat layers. Cover tightly with plastic wrap; refrigerate until set, about 1 hour. Cut dessert into serving pieces; place on dessert plates. Top each with about 2 tablespoons strawberries and about 1 tablespoon remaining whipped topping. For a "lighter" version of this recipe, use sugar-free gelatin and reduced-fat whipped topping.